When I received the 4GB kit to review I was a little dismayed to see that GSkill appeared to have simply removed one module from the 6GB kit, tweaked the packaging adjusted the price to reflect this change. I would definitely liked to have seen at least a different module sticker, perhaps in blue to distinguish this kit from the 6GB brethren. While the old adage of if it isn't broken why fix it still applies, there is no excuse for being lazy. I would also have liked to have seen a little more attention to details as Green PCBs are so yesteryear and need binning as soon as possible. Black is the new green guys. That said, I do like the aesthetics of the Trident kits which look both classy and cool at the same time; just a few tweaks from being perfect. Where this kit does distinguish itself from the 6GB kit is with the overclocking. I was delighted to see that the GSKill Trident 4GB kit overclocked very easily and surpassed my expectations by a fair margin. Not only did it hit the dizzy heights of 2150MHz but also managed latencies of 7-8-7-24, not bad when you consider this was done with only a very slight bump in voltage. I expected multiple BSOD at these speeds but alas my worries were unfounded as the kit was rock solid stable which was very impressive. The good news does not stop there though. 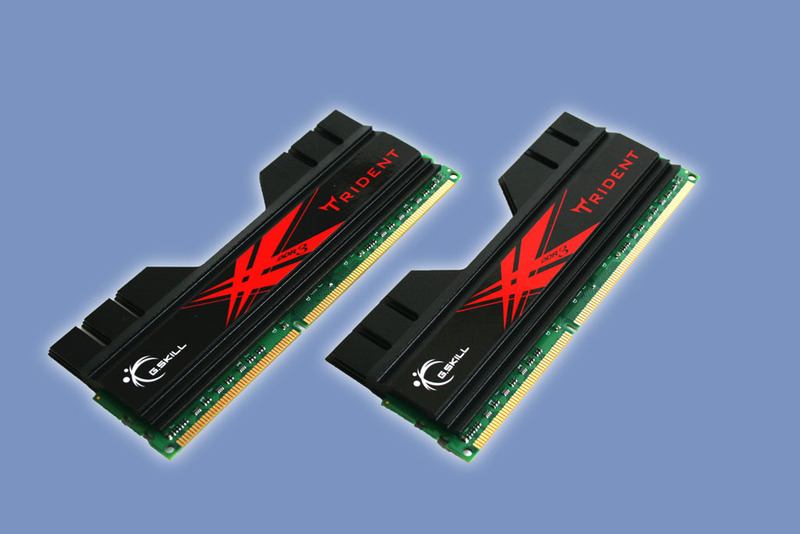 Priced very competitively at around the £87 mark, it is clear DDR3 prices are now beginning to become very affordable and with DDR2 prices rising day by day, the two formats will soon pass one another on the price index ladder making DDR3 the more attractive choice. When you consider that some comparative kits cost upward of double that of the GSkill Trident, it doesn't take a Astrophysicist to figure out where your money should go. Couple this with the fact this kit also overclocks like a dream, you would have to be a fool not to consider the GSkill Trident 4GB kit. Thanks to GSkill for providing the 4GB DDR3 memory kit for todays review. Discuss in our forums.